Northern Ireland will play Belarus in the final home warm-up game before the Euro 2016 finals on Friday 27 May. The game will be a last opportunity for fans to see the team playing at Windsor Park ahead of the finals in France. 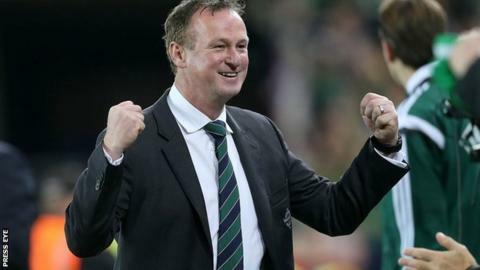 It is a first international between the countries and Northern Ireland manager Michael O'Neill said Belarus will be "a good test" for his players. NI complete their Euro build-up away to Slovakia on 4 June and play Poland, Ukraine in Germany at the finals. Belarus played in the same European qualifying group as Ukraine, who are Northern Ireland's opponents in their second group game at the finals. They finished fourth in their group behind automatic qualifiers Spain and Slovakia and third-placed Ukraine. "Belarus have had a solid season so far and they will provide a good test for us as we build towards our first game in France," said O'Neill. "The game, of course, will also act as a send-off for the team so I'm sure there will be a great atmosphere in the stadium, which the players will really appreciate." After the game, O'Neill will take his squad to Austria for a week-long training camp before completing their preparations with a friendly against Slovakia in Trnava. Northern Ireland's opening Euro 2016 game is against Poland in Nice on 12 June. They play Ukraine on 16 June in Lyon before taking on world champions Germany in Paris five days later.